Indiana University Press, 1969. 1st. Cloth. Collectible; Very Good/Very Good. The 1969 1st edition. Solid and VG (with small former owner stamp at the front free endpaper and underlining only to the first paragraph of the Preface) in a bright, VG+ to Near Fine dustjacket. Octavo, 170 pgs. London: Putnam, 1955. 1st. Cloth. Collectible; Very Good/Very Good. The 1955 1st edition. Solid and VG (with light offsetting and foxing at the free endpapers) in a bright, price-intact, VG dustjacket, with very light chipping at the panel edges and light siling to the rear panel. Octavo, 240 pgs. New York: Van Nostrand Co, 1929. 1st. Cloth. Collectible; Fine/Very Good. 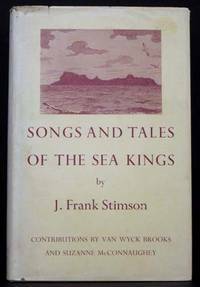 1929 1st edition, IN THE UNCOMMON PICTORIAL DUSTJACKET. Solid and clean and Near Fine in a bright, price-intact, VG+ dustjacket, with light creasing along the panel top-edges. Octavo, 249 pgs. A profile, by the interpid female author, of pygmies and headhunters of the Phillipines. Kopenhagen: C.A. Reitzels Forlag, 1933. 1st. Original Wraps. Collectible; Very Good. 1933 1st edition. VG- in its original blue/green wrappers, with a degree of soiling near the front panel's fore-edge and light foxing at the rear panel. Quarto, 158 pgs. plus 11 plates (including 1 fold-out map at rear). Salem, Mass: Peabody Museum, 1957. 1st. Cloth. Collectible; Very Good/Very Good. 1957 1st edition. VG in a bright, VG dustjacket, with very light scuffing along the panel edges and light offsetting at the gutters. Octavo, 237 pgs. Caracas: Fundacion La Salle, 1980. Cloth. Collectible; Very Good/Very Good. First Edition. A handsome example of the first 2 volumes of this series on the Aborigines of Venezuela, monographs # 26 and #29 respectively issued by the Fundacion La Salle of Caracas. Both volumes tight and solid and VG in their original russet cloth, with bright gilt-letttering to the front panels and spines. In bright, VG pictorial dustjackets. Fairly severe bumping at the lower corners of each volume, otherwise clean as could be. Octavos, 790 pgs.all told, multiple fold-out maps to each volume.